So, here they are. Seemed mean to leave out the 4th grandchild hence the extra picture. And in case you're wondering, I was desperate for a grandchild and got 3 within a two week period! Beth and twin boys Jack and William. Molly came along a couple of years later. It's amazing that the 'driver' can still squeeze into the same clothes! Are we allowed to caption this photo? Or was this off a film set or when and where taken? Car looks too clean to be a real life pic. The picture is actually a still from a film ( not sure which one ) shot in 1983. Have the wheels arches had a scrape on something white? or is it a "wartime" photo - when the edges of cars were painted a bit like that? 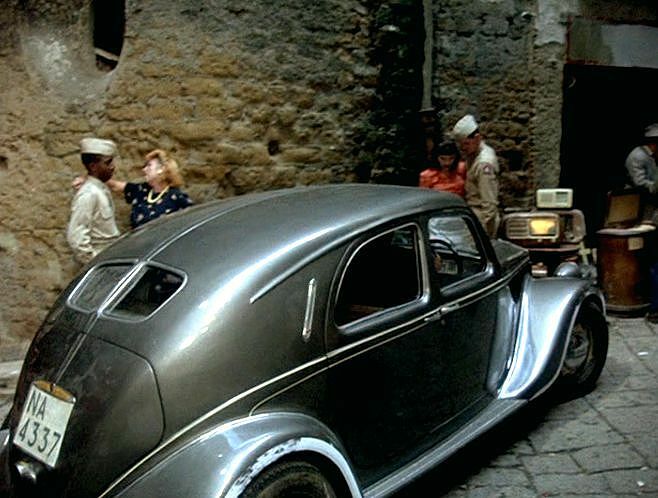 You're both right ... it's from the 1981 film La Pelle ... set in wartime Naples. Here are some more stills of the Aprilia: https://www.imcdb.org/v302040.html; the film also included Ardea and Augusta. Nice photos Robin. I bet you're glad your grandchildren can't get their muddy footwear on the seats anymore! Are they brake lights at the sight of the Gendarmerie sign? That's a good one Peter, how did it perform? While the handicap was quite tough, I did expect it to do a bit better. It ended up well down the list. But I gather he did drive it from Italy and presumably back again. I hope he enjoyed himself.